Copies of A Warrior’s Heart: The True Story of Life Before and Beyond The Fighter by Micky Ward with Joe Layden and Irish Thunder: The Hard Life and Times of Micky Ward by Bob Halloran are available to borrow from the Pollard Memorial Library. Start a book discussion of your own with your friends, family, neighbors, or co-workers OR join us at one of our informal book discussions at the library. Kick-off Lowell Reads Micky Ward with a little friendly Wii Boxing competition and Micky Ward trivia contest. Prizes will go to the victors. Join us for an informal book discussion of Bob Halloran’s Irish Thunder: The Hard Life and Times of Micky Ward. We’ll generate some questions to ask Mr. Halloran when he visits later in the program. Hear the stories from some local legends featured in The Fighter. Deb Belanger, Executive Director of the Merrimack Valley Convention & Visitor’s Bureau, City Councilor Rita Mercier, and special guests. Free screening of the Academy Award winning The Fighter. Sponsored by the Friends of the Library. 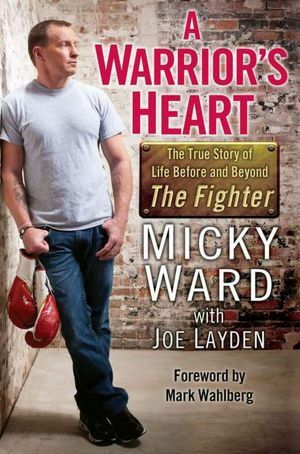 Join us for an informal book discussion of Micky Ward’s memoir A Warrior’s Heart: The True Story of Life Before and Beyond The Fighter, written with Joe Layden. Featuring former Lowell Police Officer Mickey O’Keefe and West End Gym owner Art Ramahlo in a conversation about training Micky to become a warrior. Featuring Dr. Joe Downs and Mel Peabody in a lively and informative conversation about Lowell’s rich amateur boxing history. Bob Halloran will visit to give a talk about his book Irish Thunder. A book-signing will follow – UMass Lowell Bookstore will have copies available on site for purchase. Bob Halloran is the weekend news and sports anchor at Channel 5, WCVB-TV in Boston . He is the author of four books, including Breakdown: A Season of Gang Warfare, High School Football, and the Coach Who Policed the Streets, and The Fellowship of the No Longer Miserable, proceeds of which benefit the Jimmy Fund. His new book, Impact Statement: A Family’s Fight for Justice Against Whitey Bulger, Stephen Flemmi and the FBI is scheduled for release in November. Join us at UTEC for a special wrap-up party showcasing talented Lowellian writers reading from their own work. Writers include Paul Marion, Dave Robinson, Kate Hanson Foster, Ryan Gallagher and others. Refreshments provided. Request your copy Irish Thunder and A Warrior’s Heart today. The aim of Lowell Reads is to get everyone in Lowell on the same page. We’re promoting literacy and fostering a better sense of community by creating an opportunity for Lowellians to engage with their neighbors in a meaningful discussion over the same story.